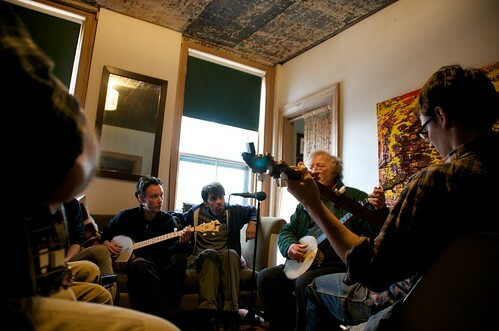 Here’s the first bit of audio I’m posting from the Brooklyn Folk Festival – John Cohen of the New Lost City Ramblers leads a banjo workshop focusing on different tunings and styles used by a number of banjo players he has learned from either directly or studied through their old recordings. Banjo player Wade Ward describes tunings as “different atmospheres.” Each banjo tuning carries its own set of possibilities and its own feeling. In 1965 John Cohen encountered Ward and many other banjo players as he journeyed through the South finding musicians, making field recordings, discovering banjo tunings and lots more along the way. Many of these field recordings were released on his wonderful album “High Atmosphere”. John discusses and demonstrates these many styles, sounds and techniques in this workshop from May, 17th, 2009. Down Home Radio Rufus Crisp Feature Episode – playing recordings of Crisp, a banjo player very influential to John Cohen and the early folk music scene in New York. 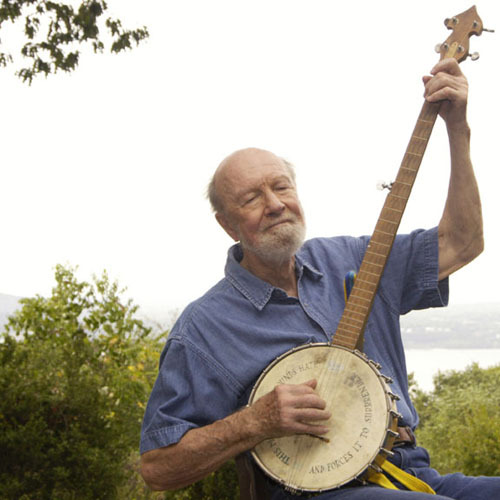 Pete Seeger Turns 90, Happy Birthday! On today’s show we honor Pete Seeger on his 90th birthday. Pete Seeger is a man who in his person has been an incredible force in American music and social movements, both as a performer and as an organizer and well spring of good ideas. He has been literally everywhere for so many many years, singing, playing and inspiring people around this country and around the world to sing, play guitars and banjos and take part in the social struggles that define their history. Pete has an off the charts level of talent as a singer, song leader, banjo and guitar player, performer, songwriter, song adapter and folk music popularizer. He’s also probably the oldest person to ever make a comeback, having won a grammy and played at the Obama inauguration concert. Pete Seeger is impossible to keep down, I was talking with some people recently and we were recalling that even when Pete was blacklisted in the 50’s the upshot of that was that he started playing for kids at schools and summer camps and thereby played a large part in inspiring the folk music boom of the 1960’s when those kids grew up. I was at a reunion of people who used to gather to play folk music in Washington Square park back in the 50’s and 60’s here in New York City and I recorded a bunch of short interviews with these folk musicians remembering encounters with Pete Seeger. So many musicians and lovers of folk music from that generation remember encounters with Pete Seeger that changed their lives. So on today’s show we’ll hear a bunch of my favorite Pete Seeger songs along with a selection of interviews with people that Pete inspired. Also included here are the A sides of two obscure Pete Seeger albums available at Smithsonian Global Sound . Pete Seeger Sings and Answers Questions, 1968. The 3rd play button in this post: Carly Nix interviews Eleanor Walden, organizer of a grassroots campaign to get Pete Seeger nominated for the Nobel Peace Prize via an online petition. This is the first grassroots attempts to get someone nominated for the Nobel Prize. Walden also talks about her personal experiences with the Greenwich Village sings, the People’s Songs Collective and the Folk Revival scene and social activism. Here’s a film, “To Hear Your Banjo Play” from 1947, produced by Alan Lomax and featuring a young Pete Seeger as the narrator. On today’s show I speak with New York folk singer and song writer Jessy Carolina. Originally from Venezuela, Jessy grew up in North Dakota and later New York City. She sings a lot of early blues songs, old-time and folk songs, Woody Guthrie songs and writes her own songs. We recorded this interview in a park in New Orleans when we were both down there back in February, busking on Royal street and escaping the New York winter. Jessy plays live on the show, talks about her background, the trip down South and life busking in NOLA. I also play some live recordings that I made of Jessy at the Jalopy Theater in Redhook, Brooklyn. Jessy will be performing, along with 20 other great acts, at the upcoming Brooklyn Folk Festival, which will be held at Jalopy the weekend of May 15th -17th. Its gonna be fun! 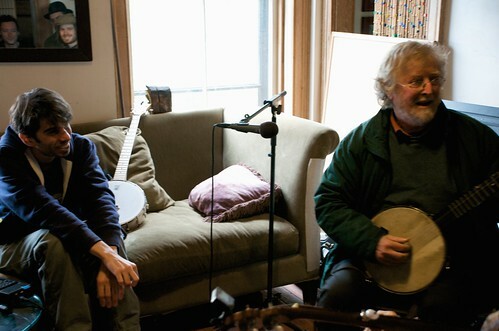 Check out www.BrooklynFolkFest.com for details. Jessy Carolina sings “Oh Babe It Ain’t No Lie,” by Elizabeth Cotten on the streets of New Orleans, Feb. 2009. On today’s show I speak with Eric Isaacson, founder of Mississippi Records & owner of the record store by the same name, located on Mississippi Ave. in Portland, OR. Mississippi Records has been releasing some really amazing music, compilations of old 78s which are really well chosen and programmed as well as more modern recordings of vernacular music, a lot of gospel and blues stuff. They are committed to releasing their music on vinyl LPs, but occasionally they do small releases of cassette tapes. Whoever is responsible for the artwork on their record jackets should be commended, they’re really great. On today’s show we will hear a selection of cuts drawn from various MS Records releases, and then we’ll feature, in fact hear the whole A side of their new release, “True Story of Abner Jay.” This is an amazing record of Abner Jay a one man band and song writer from around Atlanta, GA who passed away in 1993 and had apparently been actively playing since the 1930’s. He has a deep style that is related in some amazing way to Bob Dylan’s music, but is really its own and operating on a number of levels. He plays the guitar or 6-string electric banjo, harmonica and bass drum and high hat with his feet. See below for a video of him. Vinyl LP records are back. A lot of people I know own typewriters. Many musicians, photographers and other artists record their work analogue and then transfer it to digital later for distribution. Examples include musicians recording to old fashioned tape machines and photographers using various film cameras, working in the darkroom and then digitally scanning their work. What does this mean? Why do people continue to use obsolete forms of technology? The answer that I’ve often heard when discussing this with people is that these technologies still work well, they still exist and are in fact better suited to certain uses and forms of expression than more recent inventions. I will try to summarize here some of the ideas I’ve heard knocked around lately plus add in some of my own thoughts that I’ve hatched while trying to write this article! There is a dual relationship developing between the physical world and the digital world. People obviously want to go into the digital world, but they want to leave it too, out of a pure physical and psychological need to see, hear and touch something plain and simple. On a personal level and on a cultural level people are also judiciously considering their notions of technological progress. Practically speaking, through a process of trial and error, they are finding out what forms of technology work best in different situations. Digital: Looking at information on a computer screen, or even typing in album titles, pressing play and listening to music on a computer – all of this is like looking through the glass at a diorama in a museum, with the feeling that if you stepped through the glass it would all come alive. What’s the difference between digital music in a computer and a vinyl record with its sleeve? I think that CDs will eventually die out, and in the short term will be used mostly to transport music from a vendor to one’s computer. Most people will get and listen to their recorded music digitally, and some smaller number of people will gravitate towards vinyl records. These people will use digital music to some lesser and practical extent, such as when traveling, listening to internet radio or to something unavailable on LP. For myself, if I hear something I really like and treasure I’d want to own it as a physical object on LP, where as something I were only lukewarm about I might want to just have filed away digitally.